Enjoy afternoon tea in Bath while listening to the Pump Room Trio at the elegant Pump Room Restaurant. Traditional Pump Room Tea – Enjoy our sumptuous interpretation of the ritual that began in the 1800s, when the 7th Duchess of Bedford found a way to fill the ‘hungry’ gap between lunch and supper! £27.00. 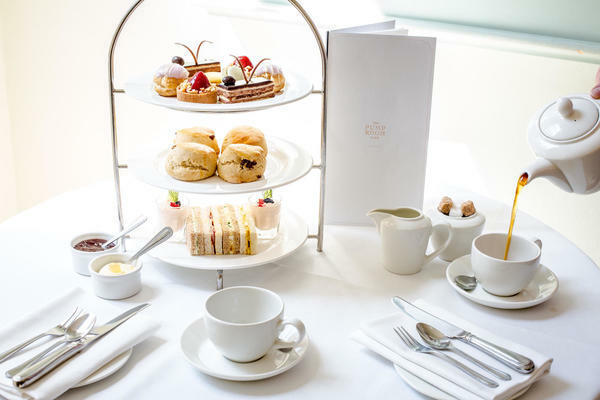 Champagne Pump Room Tea – The traditional Pump Room tea served with a glass of Searcys Champagne, £36.50. Beau Nash Cream Tea – A tasteful tribute to the celebrated dandy and promoter of polite manners, Richard ‘Beau’ Nash, who transformed Bath’s social scene and reputation, £27.50. Somerset High Tea – From our county, renowned for its lush, green farmland and abundance of apple orchards, indulge in a selection of local specialities, £19.50. All tea packages include a pot of loose leaf tea or hand roasted coffee with complimentary refills. To see what's included in the afternoon tea packages download the afternoon tea menu here. Please note: Menus are subject to change. Please click here to book a table online. For further information please call 01225 444477 or email us. Walk in tables are available daily.